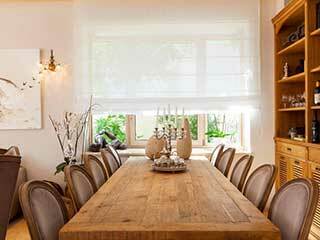 Roman shades are a great option if you are looking for custom window treatments. These roll down shades are loved by many homeowners for their unique and beautiful look and design. Because these window coverings use light filtering fabric, they're naturally a very customizable option. You can choose to use different fabrics, thus allowing for more or less light filtering and UV protection. The ability to customize Roman shades in this way makes them an easy upgrade to your overall home décor that also increases the functionality of your windows. The structure is what separates these coverings from their counterparts. Roman shades consist of an array of folds that, when opened, stack up evenly, creating a unique eye-catching look. This unique method of operation makes for a great variety of design options. You can get the classic pleated style or looped Roman shades that are excellent at creating the illusion of extra depth. The variety doesn't end with design. The range of materials used to create Roman shades is also extensive, from bamboo to thick fabric. Roman shades are used to completely block out the light from windows when the shades are fully lowered. When light is desired, however, they are easily lifted in order to reveal a completely unobstructed view out the window. Soft pleats or flat lays are also customizable options depending on if you're looking for a traditional look or a more modern look. The trimmings and bottoms can also be customized and can be curved or straight, according to your taste. Newport Beach Blinds & Shades aims to be the no.1 source of window treatments that every local home and business owner reaches out to. Do you want to replace your old window coverings with some type of beautiful and functional Roman shades? Then contact us today and have one of our local experts meet you at your home or office for a free consultation.